It's that time of year. The time when many people across the world set about using up the sugar, fat, and eggs they have stored in their pantry and fridge to prepare for a time of penance and sacrifice. Fat Tuesday, otherwise known by its French translation, Mardi Gras, falls in two days time. Traditionally, on the Tuesday before Lent, Catholics and other Anglicans have eaten rich, fatty foods both in order to use up the ingredients they had around, like I mentioned, but also to prepare for the ritual of fasting. One last hurrah, if you will. Even though I don't practice either of those religions, learning the traditions and practices of any portion of a culture is important to understanding them. Respecting those traditions builds compassion, respect, and friendships. In my eyes, at least. These days, I've run across many people who don't even know why they're celebrating Mardi Gras. To them, it's just a week-long party in New Orleans. In actuality, it's celebrated world wide. But yes, in many places it has turned into a week-long celebration culminating on the Tuesday before Lent. Some people know the same day as Shrove Tuesday; shrove meaning "confess". Pancakes are to Shrove Tuesday what Pączki are to Fat Tuesday. Its popularity is mainly in the UK (or elsewhere from those who have moved and brought the tradition with them), and is often referred to as Pancake Tuesday. Traditionally the pancakes are not American-style fluffy pancakes, but thin crêpes. But since both use fat, eggs, and sugar, I bet either version is acceptable. 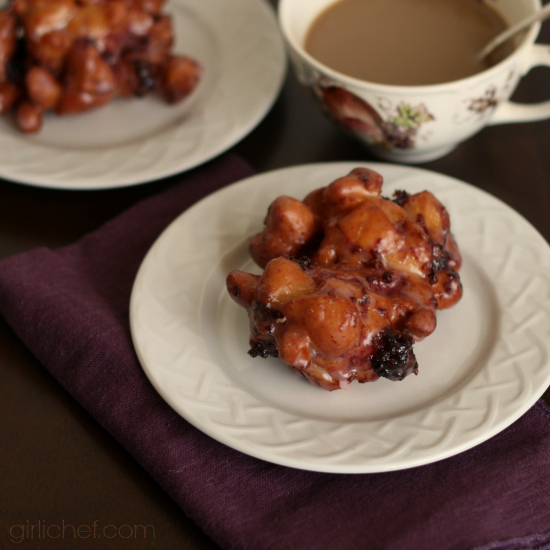 These Blackberry Fritters are a delicious and decadent way to put that fat...that sugar...those eggs...to use in honor of Fat Tuesday. But they're good any other day, too. My typical nod to Fat Tuesday is the consumption of at least one Pączki. I'll be making a batch this year, as a matter of fact. Do you have any Fat Tuesday traditions? Place all of the dough ingredients, in the order listed, in the bowl of a stand mixer or the pan of a bread machine. If using a mixer, start with paddle attachment until everything is combined, then switch to a dough hook. If using a bread machine, choose dough cycle and hit start. You're looking for a dough that is not sticky, but still tacky and able to clean the bottom of the bowl. Knead for about 5 minutes in the stand mixer once the dough comes together. If using a bread machine, let it run the cycle (knead and rise). If using a stand mixer, after kneading when you dough is smooth and pliable (yet tacky), transfer to a lightly oiled bowl, cover with plastic and allow to rise in a warm spot until doubled, ~60-90 minutes. Line two baking sheets with parchment paper and flour the paper lightly; set aside. Turn risen dough out onto a very lightly floured work surface and pat it out into a 10-inch square (use a rolling pin lightly, if needed). 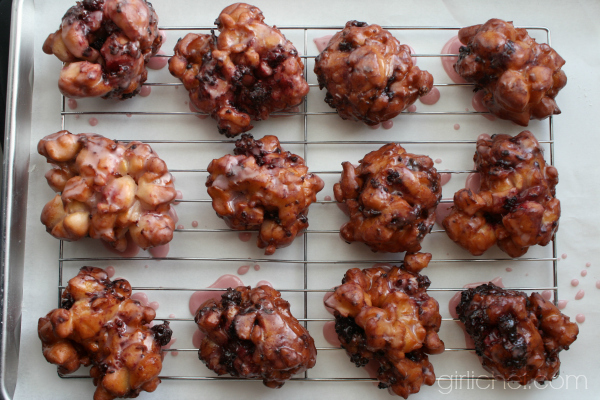 Spread the frozen blackberries over half of the square, then sprinkle the sugar and flour evenly over the blackberries. Fold the empty side over the square over the blackberries. Use a metal bench scraper to cut into 1/2-inch strips lengthwise, and then again crosswise. Scoop the stray bits and rearrange them again into a rectangle about the size you originally started with. Repeat the cutting again, in both directions. 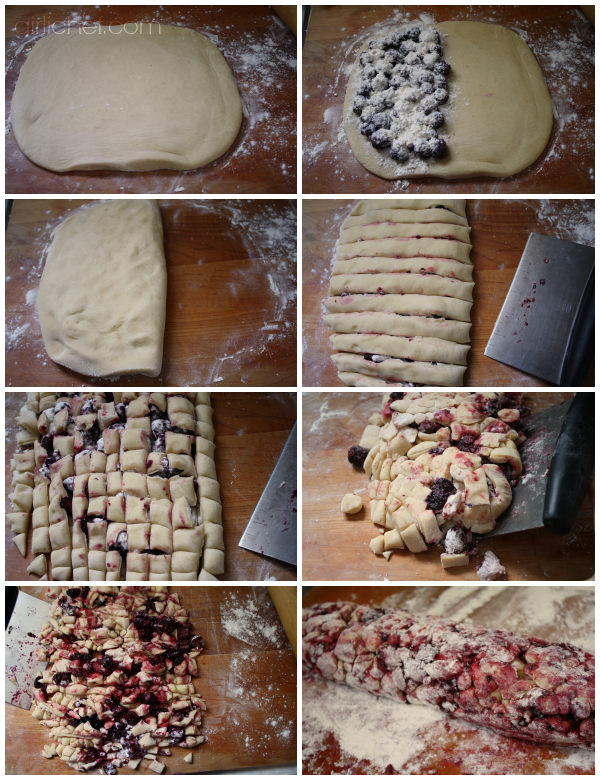 The mixture will be sticky because the berries are starting to thaw, and you should have a load of little dough scraps. Flour your hands and the dough, and form the scraps and berries into a log that measures about 12-inches long and is about 3-inches thick. Cut the log into 12 equal slices, use floured hands to pat each slice into a palm-sized mound, then set the mounds on the baking sheets, spread apart. Let rise, uncovered, in a warm spot for another 30-45 minutes; they should almost double in size. Pour at least 2-inches of oil in a deep pot, attach a candy thermometer to the side, and heat oil to 340° F. Line one sheet tray with paper towels, then set a wire rack over the top. Line a second sheet tray with wax paper, then set another wire rack over the top of that one. 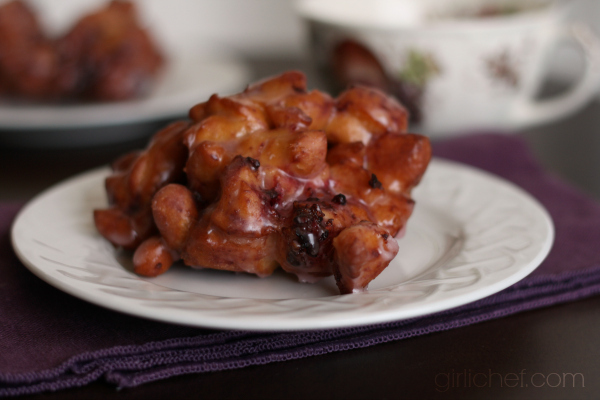 While the oil is heating, whisk together all of the ingredients for the glaze, making sure that the water is hot (because you want the glaze to be warm when the fritters are ready for dipping). Set aside for now. When the oil comes to temp, carefully lower a few of the dough mounds into it, taking care not to crowd them - this will cause the oil temperature to drop too much, resulting in oily fritters. Fry until the fritters are a deep golden brown, about 2-3 minutes total, flipping halfway through. Lift out and set on the tray lined with paper towels. Repeat until all of the remaining dough has been fried, allowing the oil to come back up to 340° F before adding another batch. 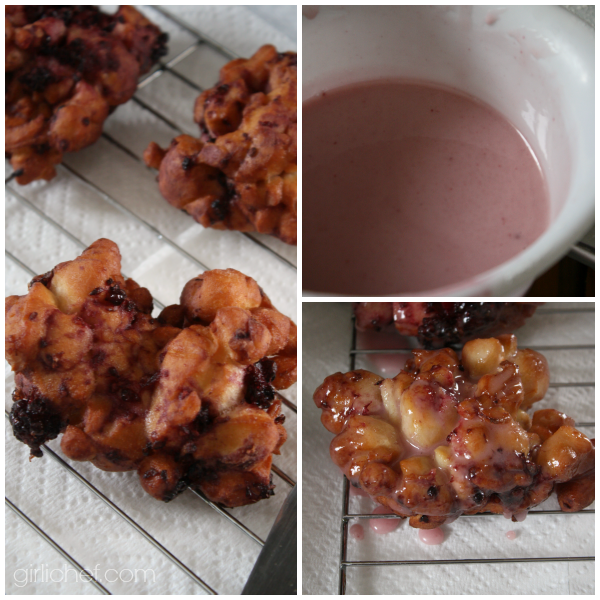 Dip each fritter, rounded side up, into the warm glaze, then set on the sheet tray that was lined with wax paper. You want both the fritter and the glaze to be warm, so I found the best time for dipping was once the next batch of fritters went into the oil. Let sit on racks, glazed side up, until the glaze is dry, 10-15 minutes. Enjoy!